Bd.20 Aout, Sec. Touristique e, 80000 Agadir, Morocco. 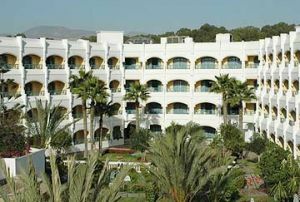 Modern building, opened in 1995, located in a tourist site, 500 meters from the beach and 10 minutes on foot to Agadir centre town. 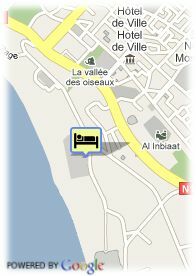 Offers 280 well-equipped rooms with television, phone, air-conditioning, mini-bar and bathroom. Hotel facilities: restaurant, coffebar, meeting rooms, fitness, swimmingpool. Kostenlose open air Parkplätze beim Hotel, Bus Parkplätz.